SOPREMA is mainly active in the building sector, an industry with a strong ecological and carbon footprint. From construction to building use, we are convinced of our ability to bring about progress—actual progress to reduce and limit the negative effects that we can collectively have on people’s environment and quality of life. As we are aware of our role, we recognize the importance of adopting good practices that are synonymous with value creation to move society forward and guarantee the sustainability of our planet. 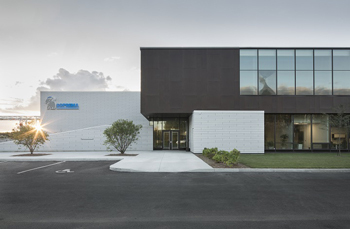 Whether for creating quality jobs in several North American regions or reducing the distance traveled to meet the needs of the industry, the positive impact of SOPREMA’s sustainable solutions depends mainly on the reduction of the ecological and carbon footprint generated by the construction and operation of a building. By focusing on the quality and durability of our products, our solutions can extend the life of buildings. For example, if the right choices have been made as early as the building design phase, resurfacing of the roof membrane will be done when it reaches the end of its life. This reduces the transportation of construction waste to landfill sites while decreasing the need for new materials at the source. We constantly encourage our customers to choose this type of solution. At SOPREMA, sharing our knowledge and expertise is a desire based on a twofold perspective: on one hand, to consider concerns related to professional qualifications, and on the other hand, to optimize the service and the level of service provision provided by building professionals. To do this, we focus our efforts on collaborative research projects, training programs and ongoing expert support given to industry stakeholders. SOPREMA is a partner of choice in the completion of construction or renovation projects aimed at being recognized by the Leadership Energy and Environmental Design (LEED®) assessment system. We understand sustainability in buildings, so we offer our know-how and products to facilitate LEED® credits® acquisition. SOPREMA’s efforts in sustainable development are not new. We adhere to several certifications recognized nationally and internationally. SOPREMA was the first company in its industry to obtain an ISO 14001 certification in January 1997 to improve its environmental management system. To meet the requirements of this standard, we implemented an environment policy that we carefully follow. In addition to monitoring impacts and measuring environmental risks, we established contingency plans. It is essential for SOPREMA to adhere to the ISO 9001 standard, as offering products and services of excellent quality is its main goal. Known for our great expert and personal support, we want to continue to meet our customers’ needs while respecting the applicable regulatory requirements. To do so, we continually assess our methods to increase satisfaction and limit the risk of failure. Ensuring a safe, healthy workplace is a priority. That is why we adhere to the OHSAS 18001 standard to identify and manage occupational health and safety risks. The analysis of operational management, emergency preparedness, and risks and hazards identification planning are key requirements that we must satisfy. Also known as an “Entreprise en santé”, adhesion to this standard has been natural, as prevention, promotion of healthy lifestyles for its employees, and adoption of organizational practices contributing to health in the workplace are some of our concerns. Every material manufacturer has a duty to consider the impacts of its products on nature and human health, from their manufacture to their destruction. That is why SOPREMA decided to adopt a transparent approach. Despite the risks that information disclosure poses to our business competition-wise, we nevertheless publicly share this information in order to address the concerns of our stakeholders.